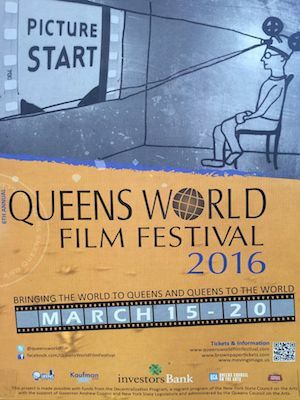 The 6th Annual Queens World Film Festival (QWFF) opened to SRO audiences on Tuesday with screenings continuing at the Museum of the Moving Image (MOMI) in Astoria, Queens, NY, and three other venues, the Secret Theatre, PS 69 and All Saints’ Episcopal Church thru ‎March 20th. Full Festival passes and Individual Tickets are on sale on line. Check out www.queensworldfilmfestival.com for the full schedule and to view trailers. The feature films selected for competition include 6 Narrative Features from 3 Female Directors and 3 Male Directors with 1 from Ireland/US, 1 from Nepal, 1 from Iran and 3 from the US. The 7 Documentary Features selected are from 3 Female Directors and 4 Male Directors with1 film from Finland/Afghanistan, 1 from China/Germany and 1 from Haiti with 4 from the US. 143 films from 23 countries are binge screened in total over the 6 days of the festival. With 29 world premieres, 22 US premieres, 38 feature length and 85 short films (Narratives, Documentaries, LGBTQ, Animation and Family friendly) with 29 filmmakers from Queens, 42 female directors and 30 female producers. Smithereens was the first American independent feature to be shown in the Official Competition at the Cannes Film Festival. The international rights to Smithereens were recently acquired by SHOUT! Factory (shoutfactory.com), and later this year the film will be released into the physical DVD and digital market by The Criterion Collection. Ms. Seidelman subsequently directed the hugely successful movie, Desperately Seeking Susan, featuring Madonna in her screen debut. Cato programs the films in thematic blocks with evocative titles, and each program is followed by a post-screening dialogue.Alumni are not automatically accepted, and names are no guarantee either. The real stars are the films themselves. “It’s about surrendering to the cinema experience, without looking for familiar names, titles, scores. It’s about creating the right context for personal, intimate discoveries you will not find anywhere else on the planet,” states Cato. An ex-prostitute marries for love, but leaving the shadow of her dark past is not as easy as it seems. A musician navigates a hyperreal combination of live action and animation daydreams in a series of interlocking Moebius strips, of parallel identities and existential humor, set to an original soundtrack. A sister fights all odds to take care of her young brother, until things fall apart, and she is left with no option, but sell her dignity to save him. Lyle is traveling with a white rabbit, the promise of a gig and a life-long dream to be able to magically disappear when he discovers Mabel a Native American grandmother. Two stories, beautifully interwoven reveal the alienation and meaning to be found when the disconnected connect in a (dis)connected city. After living nearly his entire life in New York City with false documents, burgeoning Finance professional Camilo Sanz receives a notice of deportation. Desperate for a solution at any cost, he obtains funding from a nefarious neighborhood loan shark, and dives head first into a fraudulent marriage. Marzia dreams of peace, independence and a good job. But because she lives in Afghanistan, her dreams are revolutionary. Marzia’s story becomes a symbol of the wider struggle of Afghan women: It is about the right to make decisions about your own life. The film follows Marzia’s life from spring 2011 to the end of 2014, when international troops were supposed to leave Afghanistan. A New Hampshire mother became a prisoner of her own mind, a fate which she documents in one of the most evocative and chilling accounts of mental illness and of our systemic failure to protect those suffering from it. Susan Sarandon narrates the untold stories of this unique natural resource and the unlikely urban environmentalists struggling to save the bay and their way of life in this era of rapidly growing cities and rising seas. When a devastating stroke leaves her father vulnerable and dependent, the filmmakers decides to confront the silence surrounding his troubled and violent past with home movies, family photos and interviews, revealing secrets, uncovering lies, and discovering a redeeming treasure in a lost family video. In Haiti, ancestors say if something is foretold, it will happen no matter how, and nobody can change that. Artist Celeur is inspired by his Voodoo culture to create his sculptures, a reflection of the complex reality of the Caribbean country. Queens World Film Festival sponsors include; Investors Bank Foundation, Queens Council on the Arts, Kaufman Astoria Studios, Council Member Daniel Dromm and Council Member Jimmy Van Bramer, and The Queens Post. 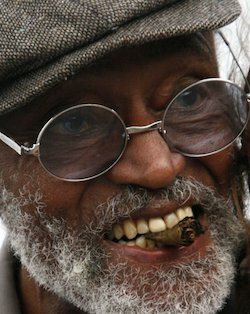 Congratulations to prolific indie filmmaker and renaissance man Melvin Van Peebles, who will be honored with the “Spirit of Queens” Award at the 6th Annual Queens World Film Festival (QWFF) at the Museum of the Moving Image (MOMI) in Astoria, Queens, tonight. 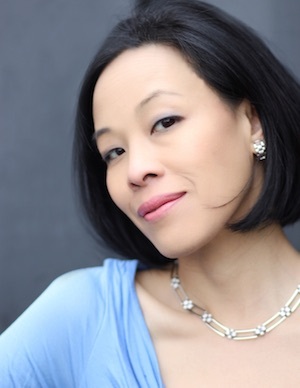 Each year, the Queens World Film Festival (QWFF) pays tribute to an outstanding filmmaker for his or her body of work. Van Peebles is an American actor, director, screenwriter, playwright, novelist, painter and composer. Successful in every medium, Van Peebles is most famous for his movie Sweet Sweetback’s Baadasssss Song‎, which heralded a new era of African-American cinema. It will be screened this evening Wednesday, March 16- 7pm at the Museum of the Moving Image (MOMI) in Astoria, Queens, followed by a Q&A with the legendary Mr. Peebles, moderated by MoMI trustee Warrington Hudlin, founder of the Black Filmmaker Foundation. 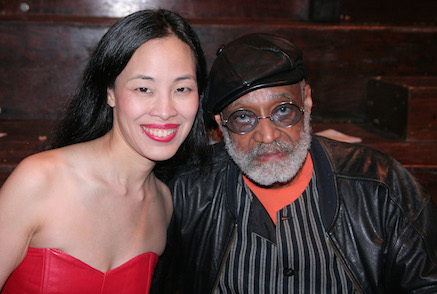 Lia Chang with her IDENTITY CRISIS director, Melvin Van Peebles at LaMaMa in New York in 2010. I had the distinct pleasure of being directed by Melvin in Identity Crisis, appearing as one half of the mud wrestling Ninja Twins. The 6th Annual Queens World Film Festival (QWFF) opened last evening at the Museum of the Moving Image. Films will also be screened at the Secret Theatre, PS 69 and All Saints’ Episcopal Church thru ‎March 20. 143 films from 23 countries will be screened over the 5 days including films from Iran, Haiti, Nepal, Germany, England and Finland. Featuring 29 world premieres, 22 US premieres, 38 feature length and 85 short films (Narratives, Documentaries, LGBTQ, Animation and Family friendly) with 29 filmmakers from Queens, 42 female directors and 30 female producers. Cato programs the films in thematic blocks with evocative titles, and each program is followed by a post-screening dialogue. Alumni are not automatically accepted, and names are no guarantee either. The real stars are the films themselves. “It’s about surrendering to the cinema experience, without looking for familiar names, titles, scores. It’s about creating the right context for personal, intimate discoveries you will not find anywhere else on the planet,” states Cato.